The exhibition at the Maranello museum includes 22 models, including several one-offs that are both extraordinary in their design and unusual in their lineage of ownership. The exhibit is split into three halls, focusing on three separate lines of thought in Pininfarina's work: race cars, road cars, and experimental models. The vehicles on exhibit are highlighted with extras and previously unseen items from the Pininfarina family's private collection to enhance the story behind each creation. In the attached gallery, you'll see a virtual tour of the exhibit and some of its highlighted entries. Race cars were a large part of Pininfarina's focus and his creations were some of the most hallowed and trophy-taking offerings in the Ferrari racing lineup. On display are speed demons like the 250 LM, which was Ferrari's last overall winner at the 24 Hours of Le Mans. The 500 Mondial and 250 MM Berlinettas are also shown as well as the 375 MM and BB Le Mans. Road cars are what Pininfarina is most remembered for, however, and make up a large part of this exhibition. He designed iconic Ferrari classics and many of those are on display at this exhibition in Maranello. The 1964 275 GTB4, the Spider version of the Daytona legend models, and the forever classic Testarossa. The exhibition is open seven days a week through January 7, excluding the Christmas and New Year's holidays. 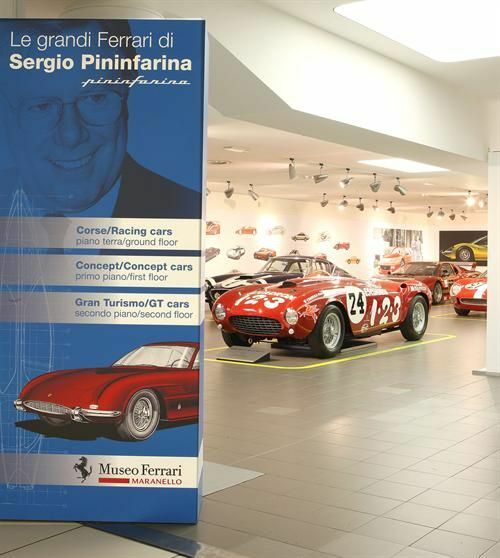 Tickets and guided tours are available online at museoferrari.com. If you're in Italy for any reason this holiday season, this is a piece of history that cannot be missed. When most of us think Ferrari, we think of the Pininfarina designs and autos that became the instant, collaborative classics in the Italian style.